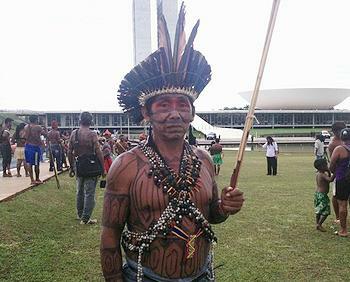 BRASILIA, Brazil, November 6, 2014 (ENS) – In a struggle between a Brazilian indigenous tribe and the federal government over two dams that would flood lands claimed by the tribe, a federal judge has ruled that the government must immediately publish its report delineating the tribe’s territory that has been withheld for more than a year. Last week, in response to a lawsuit filed by the Federal Public Prosecutors’ Office, federal judge Rafael Leite Paulo issued a ruling that requires FUNAI, the federal agency responsible for indigenous people, to publish its report within 15 days and determine the final decision on demarcation of the Sawre Muybu territory. In October 2013, after completing 12 years of field studies, FUNAI completed a technical report confirming the status of Sawre Muybu as the Munduruku people’s traditional indigenous territory. But under pressure from the administration of Brazilian President Dilma Rousseff, FUNAI and the Ministry of Justice have refused to officially publish the report, stalling demarcation. Without formal recognition, this indigenous territory is vulnerable to dam building, illegal land-grabs, mining and logging. Satellite imagery in studies done by FUNAI demonstrate the existence of several clandestine clearings opened by loggers for illegal deforestation within the indigenous territory, reports the federal government news service Agencia Brasil. Tired of waiting, the Munduruku people are now demarcating their own territory. In a statement issued Monday by Munduruku leaders, the decision to auto-demarcate their territory is a response to the Rousseff administration’s negligence in recognizing their land rights, as well as the government’s determination to construct two megadams. Now in its second week, the “auto-demarcation” of the 178,000-hectare Sawré Muybu indigenous territory is a direct challenge to the federal government’s refusal to comply with legal obligations to demarcate Munduruku lands that would be impacted by the São Luiz do Tapajós and Jatobá dams, slated for construction on the Tapajós River. For years, the Munduruku have protested the federal government’s repeated attempts to proceed with licensing and construction of the Tapajós dams, in disregard of their right to a process of free, prior and informed consultation and consent, as mandated by the Brazilian Constitution and international human rights agreements to which Brazil is a signatory. The Tapajós River, one of the largest tributaries of the Amazon River, runs through the Amazon rainforest, mostly in Pará State. 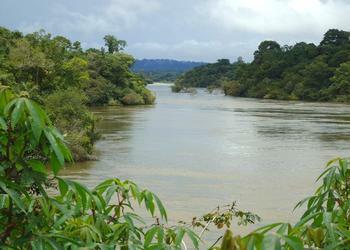 About 325 fish species are known to inhabit the Tapajós River basin, including 65 species found nowhere else. Many of these have only been discovered within the last decade, and some may be threatened by the dams that are planned on the river. Since early 2012, the Munduruku have fought the federal government’s efforts to conduct technical studies for dam projects within Sawre Muybu and other traditional lands. They have denied technicians access to their territories and detained technicians found on their lands. In late June 2013, for instance, about 25 researchers were removed by the Munduruku from their indigenous lands. The technicians were collecting samples of plants and animals for environmental and feasibility studies for the hydroelectric plants planned on the Tapajós River. According to the indigenous people, the researchers wore company uniforms of Concremat, which provides services to the Consortium study group Tapajós, led by companies Camargo Correia, GDF Suez, Eletrobrás and Eletronorte, among others, reports Agencia Brasil. “What we did was a political action of resistance. We knew there were researchers in the region for at least two months. We went after them and brought them to the city. That’s what happened,” explains Ryan Munduruku, who participated in the operation. On November 7, 2012, tensions flared when the Federal Police killed a young Mundukuru leader during a surprise action allegedly aimed at eliminating wildcat mining, but understood by the Munduruku as an act of intimidation, aimed at quashing indigenous opposition to dams on the Tapajós River. President Rousseff has responded by sending police and military forces to serve as security for teams conducting technical studies for dam construction. As part of the Brazilian Energy Expansion Plan, 40 large dams on the main rivers and 52 small and micro dams are being planned in the Tapajós River Basin.